Excel with Bet Angel - Bet Angel Professional - Betfair Trading Software. 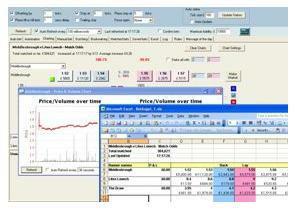 Trading Software for Betdaq & Ladbrokes. If you have Microsoft Excel installed on your computer and you are familiar with Excel functions and Excel VBA then get ready to take Bet Angel to the next level with the Excel integration feature. By linking one of the supplied blank template spreadsheets to Bet Angel you will be able to manipulate the data in any sports market and produce triggers, charts and more all designed to your own specifications. The possibilities are almost endless from simple single triggered bet spreadsheets to fully automated, unattended* betting spreadsheets already in existance. Set your own triggers and create your own betting bot. If Bet Angel doesn't do exactly what you want it to today then you will probably be able to do it using Excel. From simple BACK or LAY commands to sophisticated code to bet under whatever conditions you set. *Unattended betting is not recommended without exhaustive testing. Microsoft Excel 2003 or later required. Microsoft Excel is not included with Bet Angel Professional.